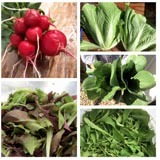 This week's CSA share is being delivered one day early so we can enjoy family who are coming from out of town. We will be back on our regular Wednesday schedule next week. So much for delivering a a "smaller share" due to us only harvesting two days this week. The farm is overflowing with wonderful food and with the help of our awesome workshares we keep putting together some great shares of summer produce. Unfortunately, there are some crops that aren't doing well in this heat. The spinach has bolted and is no longer worth the amount of time it would take to get enough for the CSA. The salad is growing well but is very buggy and time consuming. It's quite likely the salad will be skipped every once in a while or we will only be able to give smaller bags. We are starting to see more bugs in the Swiss chard and kale too. Keep your eyes open for caterpillars, aphids, ear wigs, or other critters and where they've layed eggs on the back of leaves. We do our best to sort and look through the greens muntiple times, but I'm sure we aren't 100% perfect. Hey, it's organic! As some crops struggle, others are maturing and are ready to harvest. The onions look and smell fabulous. We are growing both yellow and red onions in a hoophouse and they are doing very well. We anticipate having onions on a regular basis from here through fall. The tomatoes are slowly starting to turn colors. The basil is looking beautiful and after we get it weeded this weekend, it should be ready to harvest in two weeks. This is a picture from last week of the inside of greenhouse 6, also known as the big tomato greenhouse. The basil is growing under the black shade cloth just to the right of center. From left to right: cucumber plants (from which we are harvesting over 150 per week), peppers, Ida Gold tomatoes, basil, and Glacier tomatoes on the right. Just right of the taller tomato plants Shain is growing a trial variety of pole beans. You can't see them in the picture because they are still pretty small. We've been struggling with growing beans these past two years. Our French fillet beans have become rather famous at the farmers market and with our CSA members, but they haven't been germinating very well and are a challenge to grow and harvest. We are trying a new type of French fillet bean that is supposed to taste just as good and be a lot easier to grow. We'll see. Above is greenhouse 7 where we've planted most of the beans, along with a row of dill down the far left side, and the row of summer squash right down the middle. You can see the sparsly growing beans on these two rows above. Shain estimates we've experienced a less than 50% germination rate on the beans this year. He's determined to figure out how to adjust to this problem and make it better in the future. Well folks, it's fair week here in Star Valley. Time for some small town fun and games. One of my favorite things is to look at all the craft exhibits and farm animals. It's so good to be able to enjoy this time of year. This Saturday we will start digging up the garlic plants. It's a huge project and we invite all our members to come pitch in. There's work to be done for any and everyone regardless of strenght or size. Contact me for more informaiton. Sugar Snap Peas, the kind you eat whole, pod and all. A fabulous share! We are all eating well this week. I walked around the farm on Monday with my "big camera" (as opposed to my "small camera" that I keep in my pocket to take pictures while I do farm work, which is now at the bottom of a river somewhere). I have very good intentions of making a post here on the blog to show you how great the farm looks right now. When I sat down at the computer that evening, I experienced some lenghthy problems with my photo editing program so the blog post didn't happen. On Tuesday, I decided it was more important for me to pick the peas instead of work on the farm update. (I hope you agree.) Now here we are on Wednesday and I'm short on time to get out the door to deliver shares. Sorry for my lack of pictures and stories from the farm. I can only assure you it means we are working hard on our harvest days, and playing hard on our off days. I'm even managing to keep the house clean and our bills paid on time this summer. This has been a great summer for us. And we think the CSA is benefiting greatly from our reduced work load as well. Just today someone said "This year is so much better than last year!" I agree completely. Please remember that next week's CSA delivery will be made one day early. It will be there on Tuesday, July 31st. Golden Beets - We left the tops on the beets so you can eat them! This early in the season, the tops are still looking really good and mostly bug free. Enjoy the beet greens as an added bonus! Snap Peas - Sorry, only enough for 10 bags this week, just enough for those picking up in Smoot. We will rotate the peas to everyone in following weeks until there is enough for all of us. Cucumbers should be ready next week. Italian parsley next week too. Romaine lettuce heads are heavily infested with earwigs, our first planting may be a complete crop loss. We are watching the second planting to see how it turns out. Shain is determined to figure out how to grow head lettuce without so many bug issues. He loves crisp, crunchy romaine so he'll be trying until we get it right. All our produce is really GROWING now and already the zucchini and squash are out of control. Shain and I left the farm for two whole days last weekend and they doubled in size while we were gone. Is it too early in the season to start researching zucchini recipes? Shain made us some vegetable soup today with zucchini, squash, tomatoes and other odds and ends. We ate it with a little cheddar cheese and tortilla chips. Yummy! No recipe to share, he just added a little bit of what ever produce we have on hand to some some stewed tomatoes and voila! 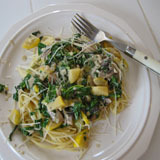 We've also been cooking up the zucchini and squash with mushrooms and wilted greens, served over pasta. There is a lot to harvest now and we are loving all this great food. We have awesome workshares who help get all this food harvested, washed, bunched or bagged, and organized into the CSA shares. The process we go through on harvest days is amazing to watch. You think the veggies look good when you get it home to eat? You should see it as we pick, pull, cut, wash, and bag it. The colors! The aroma! This is great food! And we are happy to provide it for you. We are well into the summer season here on the farm with hot days and warm nights. These conditions help our crops grow very well and the amount of food we can harvest each week is growing too. We are no longer repeating out daily ritual of covering and uncovering the veggies with row covers and are actually leaving some greenhouses all the way open day and night. With the warmer weather come some challenges. The first is working around the heat. Because leafy greens and other crops wilt with the heat, we need to start our workdays a little earlier. Our harvest crews are now showing up at 7 with most harvesting done in a few hours. Then we wash and bag produce until noon. The temperatures in the greenhouses are also a concern now and good ventilation is very important. Just a few weeks ago we were watching the weather forecasts for the low temps and now we watch for the high temps. Last, the bugs are showing up more as we harvest and wash produce. So many bugs thrive in this warmer weather, but especially the caterpillars and ear wigs. We are already seeing them in all our leafy greens. Our washing procedures take a little more time as we slow down to look for bugs. Salad is the most challenging, but we will continue making the effort because we know it is a favorite. Remember! The shares are being delivered one day early this week (on Tuesday, July 3rd), at the regular times and places. We are taking some days off this week to celebrate the 4th of July holiday with family. This week's share is a little smaller due to our shortened harvest week. Starting next week, we will be starting our work days a little earlier in the morning and increasing our workshare's work time by one hour each. This is all in anticipation for the increase in veggies we expect to start harvesting. We are on the verge of being able to harvest carrots, golden beets and cilantro. Meanwhile, so many of the other crops are doing very well and we are pleased to look around and see so much great food growing in our fields and greenhouses. This past week, we've finished mulching greenhouse 7, transplanted basil and dill, started 3 flats of butter head lettuce, fenced off a new chicken run, sold our baby goats, gave away all our old chickens to make way for new chickens, dealt with naughty goats who want to eat our peas, fixed electric fencing issues, and also some much needed weeding. I didn't mention anything special about the garlic scapes in the shares this week and last. I foget that not everyone knows about garlic scapes. We share some recipe ideas here. I plan on cooking ours on the grill (drizzled in olive oil with a little salt and pepper, probably wrapped in tinfoil). Looking forward "curly garlic french fries". Garlic scape pesto is a very popular way to use them up and it freezes well. I also like to cut some with scissors and freeze them in snack size baggies to use all winter long. I want to try dehydrating some too. They will keep in a loose sack in your refrigerator crisper drawer for a month or so. We'll have more next week, but not sure if they'll last til the week after. Eventually they started to harden off (become very tough) and are no longer edible.